Information 3d vegetation is not a common spatial information available. 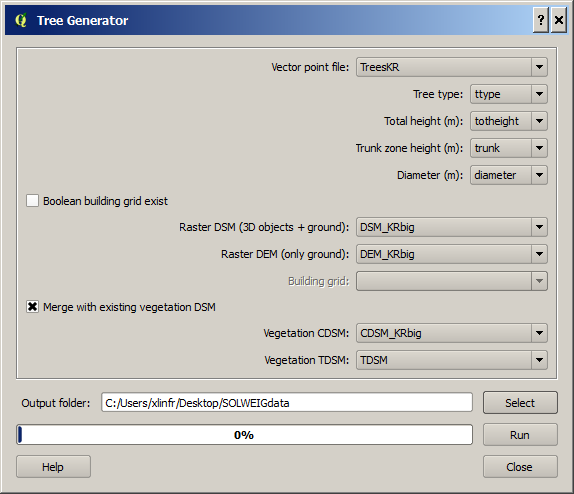 The Tree Generator can be used to create or alter a vegetation CDSM and TDSM (see abbreviations. Be using information from a point layer where the location of the points specifies the tree positions and the attributes sets the shape of the trees, it is possible to produce a the 3d vegetation needed for e.g. Mean radiant temperature modelling (SOLWEIG) or Urban Energy Balance modelling (SUEWS) in UMEP. Tree type Two different tree types (shapes) are currently included: 1 = conifer, 2 = decidouos. There is also a possibility to remove vegetation by setting tree type = 0 and with an appropriate diameter to remove all vegetation pixels from the DSMs. Total height This is the total height of the tree from the ground (magl). Trunk height This is the height up to the bottom of the canopy (magl). Diameter This is the circular diameter of the tree in meter. Tick this in if a boolen building grid exist for your model domain. This can be generated from the SOLWEIG-plugin. A DSM consisting of ground and building heights. A DEM cosisting of ground heights. A grid where building pixels are 0 and all other pixels are 1. A DSM consisting of pixels with vegetation heights above ground. A DSM (geoTIFF) consisting of pixels with vegetation trunk zone heights above ground. Two geoTIFFs are created, one CDSM and one TDSM.